It's October in Bascom, North Carolina, and autumn will not go quietly. 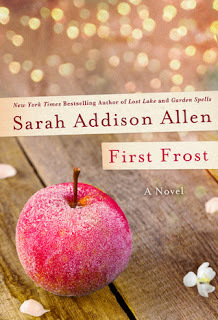 As temperatures drop and leaves begin to turn the Waverly women are made restless by the whims of their mischievous apple tree...and all the magic that swirls around it. But this year, first frost has much more in store. Claire Waverly has started a successful new venture, Waverley's Candies. Though her handcrafted confections are singularly effective, the business of selling them is costing her the everyday joys of her family, and her belief in her own precious gifts. Sydney Waverley, too, is losing her balance. With each passing day she longs more for a baby - a namesake for her wonderful Henry, Yet the longer she tries, the more her desire becomes an unquenchable thirst, stealing the pleasure out of the life she already has. When a mysterious stranger shows up and challenges the very heart of their family, each of them must make choices they have never confronted before. And through it all, the Waverly sisters must search for a way to hold their family together through their troublesome season of change, waiting for that extraordinary event that is First Frost. Sarah Addison Allen is whimsy and magic. She's southern charm and comfort. And she has a knack for creating towns I would love to live in and women I'd love to meet. Much like the Sargent family in Maggie Stiefvater's Raven Boys series, I want to meet the Waverleys. I want to become their friend, I want to attend their family functions, and I want to eat their food. Strong women who depend on one another and who just happen to have a bit a magic of their sleeve. I also want a house that locks its doors if it doesn't like you and an apple tree who picks favorites in the backyard. I want it all. The story continues several years after Gardenspells ends with the Waverley sisters happily married and their mystery still the talk of the town. Claire has taken to making candy, and Sydney's hair is turning red as she deals with her emotions and worries. Then there's Bay. Wonderful, beautiful Bay who has a knack for knowing exactly where things belong...even her own heart. When a stranger comes to town, things begin to change, and the women are desperate for the First Frost of the year to reset their lives and make things better. Not quite as good as Gardenspell, but so glad to revisit Bascom, North Carolina.